William Theodore Katt was born on 16 February 1951, in Los Angeles, California USA, and is an actor, musician, and voice artist, probably best known for being part of the series “The Greatest American Hero”. He also appeared in the 1976 version of the film “Carrie” as Tommy Ross. All of his endeavors have helped put his net worth to where it is today. 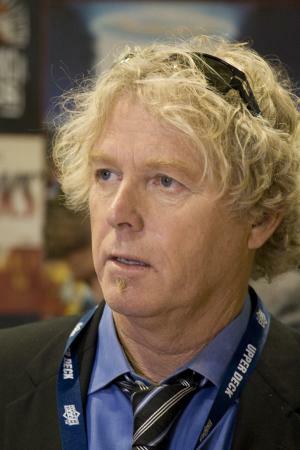 How rich is William Katt? As of early-2017, sources inform us of a net worth that is at $500,000, mostly earned through a career in acting; he appeared in numerous films in the 1970s and 1980s including “First Love” and “Butch and Sundance: The Early Days”. As he continues his career, it is expected that his wealth will increase. William attended Orange Coast College, however he did not finish his studies, preferring to pursue a career as a musician. After a while, he started an acting career with small television roles. One of his first film projects was “Carrie” in which he played a jock; his popularity started to grow and so did his net worth. He then appeared in the film “Big Wednesday” as the young surfer Barlow, starring Gary Busey and also Katt’s real life mother. In 1979 he took a role in “Butch and Sundance: The Early Days” portraying the Sundance Kid. His popularity continued to grow, and he also became known in the surfing community thanks to “Big Wednesday” – he participated in the World Championship Tour Ceremony as part of the Association of Surfing Professionals. Afterwards, William tried his hand at auditioning for the role of Luke Skywalker in “Star Wars”, and was considered for the role before it was given to Mark Hamill. Katt then starred in “First Love” which is about a college student and his first relationship. In 1981, he was cast in the Broadway musical “Pippin” which earned mixed reviews, but then got one of his most popular roles in “The Greatest American Hero”, playing Ralph Hinkley, with the show running until its cancellation in 1983, and helping to increase William’s net worth considerably. Thanks to the success of the show, he signed to MCA under the name Billy Katt, and released the album “Secret Smiles”. In 1985 Katt starred in “Baby: Secret of the Lost Legend” and the horror/comedy film “House”, reprising his role in the sequel “House IV”, before becoming known for starring in a series of Perry Mason television films playing private detective Paul Drake Jr. and co-starring with his mother Barbara Hale. He would become part of a total of nine films, and then starred in the series “Top of the Hill” during 1989. His net worth was rising consistently. Katt has since branched out to voice acting, working in projects such as “Justice League” and “Andromeda”. He also continues to act, with a few of his recent appearances including “Gamers”, “Heroes”, and “Alien vs. Hunter”. In 2013, he appeared in the spoof film “Paranormal Movie” and also wrote a “Greatest American Hero” comic book. For his personal life, it is known that William married Deborah Kahane in 1979 and they had two sons before their marriage ended in 1986. Seven years later he would marry Danielle Hirsch, and they have a daughter, with Katt also inheriting a stepson. 1 When I play a good guy, I try to explore them and figure out what shapes them and makes them interesting. When I'm playing a bad guy, I try to explore everything that makes them good. No one ever really thinks that they're a bad guy. 1 He was awarded the 1979 Drama Logue Award for Outstanding Performance for "Ormer Locklear" in a NTFN production at the Mark Taper Forum Theatre in Los Angeles, California. 2 William Katt also co-starred in several of the made-for-TV Perry Mason movies in the 1980s alongside his famous mother, Barbara Hale, and Raymond Burr. His roll in those movies was as Paul Drake Jr., a private detective, somewhat reprising the roll of William Hopper of the original Perry Mason (1957) TV series. 3 Best known by the public for his starring role as Ralph Hinkley on The Greatest American Hero (1981). 4 Acting mentor was Robert Culp. 5 Won "Best Actor" for his performance in Deadland at the 2010 Mountain Film Festival. 6 Disliked his The Greatest American Hero (1981) outfit so much, due to its look and discomfort, TV Guide had to use an illustration of him rather than a photo for one cover. 7 In 2008, he started his own line of comic books, Catastrophic Comics, with the launch of the critically acclaimed book Sparks co-created with Christopher Folino. 8 Attended and was a mentor at the 2nd annual HatcH audiovisual festival in Bozeman, MT in October 2005. HatcH is a film and arts festival whose mission is to provide mentorship, education, inspiration, and recognition to the next generation of creative innovators. 9 During California's historic gubernatorial recall, after being asked about the research and preparation he had done for his short-lived series Top of the Hill (1989) . A fan asked, "So why don't YOU run for Governor?". 10 Auditioned for the part of Luke Skywalker in the original Star Wars: Episode IV - A New Hope (1977) opposite Kurt Russell, who auditioned for the role of Han Solo. 11 Brother of Jody Katt (b. 1947) and Juanita Katt (b. 1953). 12 Attended Orange Coast College in Costa Mesa, California. 13 Has four children, two sons: Clayton Alexander & Emerson Hunter and a stepson Andrew and a daughter Dakota. 15 Lookalike son of actor Bill Williams, who starred as Kit Carson in The Adventures of Kit Carson (1951), and mother, actress Barbara Hale. 16 Appeared with his mother, Barbara Hale, in Big Wednesday (1978). Top of the Hill 1989 TV Series Thomas Bell Jr.
Perry Mason: The Case of the Lady in the Lake 1988 TV Movie Paul Drake Jr.
Perry Mason: The Case of the Avenging Ace 1988 TV Movie Paul Drake Jr.
Perry Mason: The Case of the Scandalous Scoundrel 1987 TV Movie Paul Drake Jr.
Perry Mason: The Case of the Murdered Madam 1987 TV Movie Paul Drake Jr.
Perry Mason: The Case of the Sinister Spirit 1987 TV Movie Paul Drake Jr.
Perry Mason: The Case of the Lost Love 1987 TV Movie Paul Drake Jr.
Perry Mason: The Case of the Shooting Star 1986 TV Movie Paul Drake Jr.
Perry Mason: The Case of the Notorious Nun 1986 TV Movie Paul Drake Jr.
Perry Mason Returns 1985 TV Movie Paul Drake Jr.
M*A*S*H 1972 TV Series P.F.C. Pippin: His Life and Times 1981 TV Movie performer: "Corner of the Sky", "War Is a Science", "With You", "Morning Glow", "On the Right Track", "Extraordinary", "Love Song", "Finale"